Impromptu shows leaders how to think on their feet and respond eloquently in everyday situations—elevator chats, corridor conversations, networking gatherings, meetings, and ceremonial events. Deliver your message with clarity, confidence, and conviction. Speaking successfully on the spot is often seen as an innate gift. 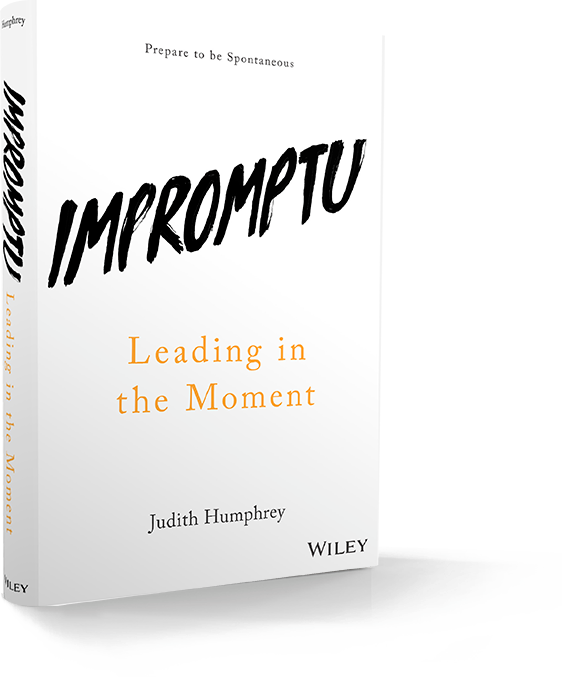 But Impromptu: Leading in the Moment shows that it is a skill that comes from preparation and discipline. “The purpose of this book is to enable every reader to become much better at extemporaneous speaking. The secret is preparation! . . .
We all have so much to say—all of us are experts in one or more fields, and we can talk endlessly if we are excited about our topic. But to say something meaningful, something motivational, something that conveys leadership on the spot, takes discipline. . . .
Tony Arrell, Chairman and CEO, Burgundy Asset Management Ltd.
Paul Vallée, Founder and CEO of The Pythian Group, Inc.
“Perfect Pitch: How to Master the Elevator Conversation,” October 20, 2017. © 2019 Judith Humphrey. All rights reserved.